All products with io-homecontrol® logo on remote control work with VELUX ACTIVE. Does your remote have an io-homecontrol® logo? Where do i find the io-homecontrol® logo on my remote? Which products do you control with your remote? Your VELUX INTEGRA® product is compatible with VELUX ACTIVE. Your VELUX INTEGRA® blind works with VELUX ACTIVE. Check if your manual roof window can be upgraded with a motor to work with VELUX ACTIVE by entering your product ID. Your VELUX INTEGRA® electric roller shutter or awning blind is compatible with VELUX ACTIVE. Check if your manual roof window can be upgraded with a motor to work with VELUX ACTIVE. Replacing your existing roof windows is quick and easy with VELUX. Choose your VELUX INTEGRA® roof windows, blinds and shutters for a seamless remote operation and a healthier indoor climate in your home. Where is the handle placed on your roof window? A manual roof window can often become compatible with VELUX ACTIVE if you add a motor to the window. 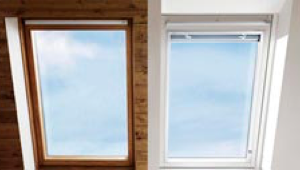 Follow the next steps to find out if your window can be converted with a motor. Compability may be possible with VELUX INTEGRA® electric roof windows and with a range of manual roof windows. 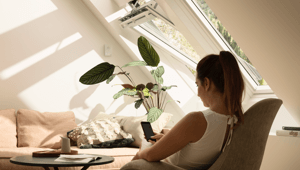 Which VELUX roof window do you have? Please carefully check your VELUX window reference plate and make sure the exact type and size codes are selected.